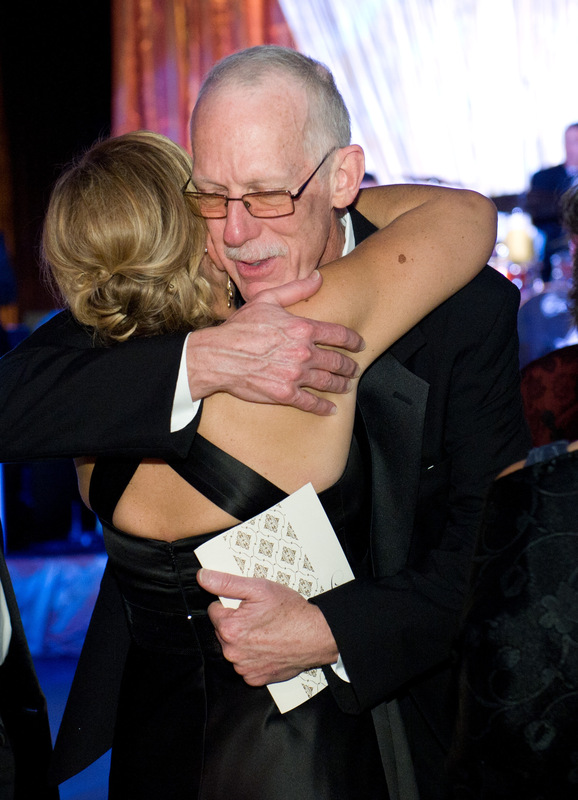 Bob Keegan at ECBT’s 20th Anniversary Gala in October – I was so thrilled to see him after many years. This past Monday an my old friend, Bob Keegan, succumbed to his battle with cancer. Since hearing the news, I’ve struggled to find the words to write about his incredibly selfless efforts to save the lives of literally millions of children; partly because I know that he’d be the first to demand that instead I should go out and take a hike with my bike…literally, or grab a beer and toast him instead. Yet, I can’t help but wonder whether he was aware that in addition to dedicating his own life towards saving the lives of people throughout the world, that he inspired untold numbers of his peers to strive to also make a difference in the lives of others? Bob Keegan was the type of man who always gave credit to others for the accomplishments that so often he himself envisioned and facilitated. When Bob was in his early twenty’s he began his 30 year career with the Centers for Disease Control and Prevention (CDC) within the branch that is known as STD control (sexually transmittable disease control) working as a public health advisor in Newark, NJ, New York City and eventually Atlanta, GA – home of the CDC. He helped to develop the first pre- and post-test counseling for HIV/AIDS during a time when the nation was first coming to grips with what would soon become a sexually transmitted disease epidemic. He then spent five years coordinating CDC’s efforts to assure that refugees from Southeast Asia were properly immunized and treated for communicable diseases. In 1991, Bob joined the newly formed Polio Eradication Activity Section of CDC along with five other dedicated individuals and a budget of only $3 million. As the deputy director of what is now called the Global Immunization Division, the staff grew to 110 with a budget of $150 million. Since 1988, the number of polio cases reported worldwide declined by 99 percent! That translates into a disease that once infected 350,000 people every year in South Africa and Asia, now affects 1,000 children each year. Yet, as I celebrate the writing of that number; I just felt Bob smack me over the head to tell me that 1,000 children is unacceptable when that number is zero here in the U.S. Of course he is right, and so the charge continues on. On the day I met Bob back in 1998, Every Child By Two (ECBT) cofounder Betty Bumpers and I were halfway around the world on a trip to Cote D’Ivoire (Ivory Coast) and Zimbabwe as part of a CDC effort to reinvigorate support within Africa for polio eradication initiatives. I remember vividly the huge smile on Bob’s face as we shook hands in the airport at the outset of our two-week journey across Africa. Personally, I was a wreck after not having slept for nearly twenty-three hours. But there was Bob; having traveled just as far, all smiles and pent-up energy. He was literally bursting with pride over the anticipation of showing Betty the incredible accomplishments made by the CDC, World Health Organization, Rotary International and UNICEF to “Kick Polio Out of Africa”. Many of these efforts were made possible in part through funding provided to CDC by the U.S. Congress with Betty’s husband Senator Dale Bumpers as the lead supporter of these initiatives. As the founders of ECBT, Betty and Rosalynn Carter were already considered a force of their own, having traveled to nearly every state in the U.S. by that time helping to encourage the development of local coalitions and garnering high-level support for vaccination efforts in each of the states. 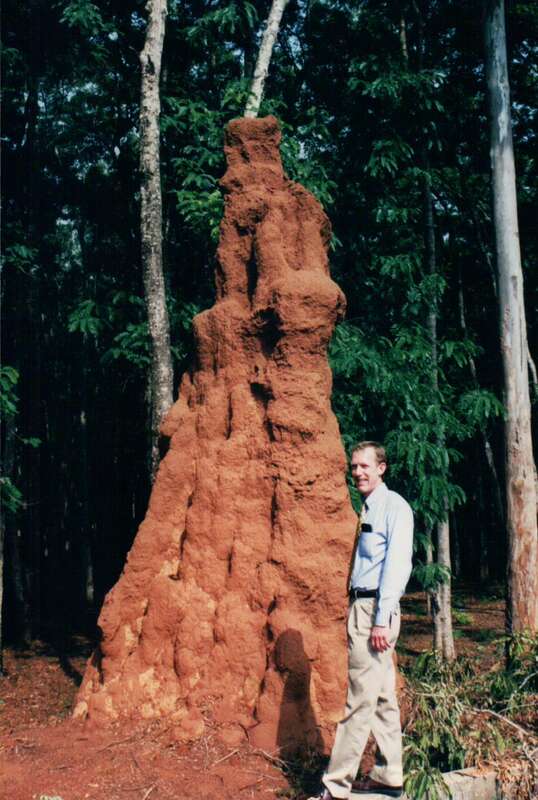 Bob Keegan in Zimbabwe beside a giant ant mound. Bob had organized our journey to villages throughout the Ivory Coast and Zimbabwe where polio eradication efforts were taking place. It is difficult to describe the atmosphere at a National Immunization Day, but try to envision thousands of villagers lining up with children in tow to receive their polio drops (children in developing nations still receive the oral polio vaccine). It is the polio eradication strategy to vaccinate every single child under the age of five with polio vaccine yearly in order to ensure that no child is missed. What struck me most of all was seeing children as young as six years old pushing through the crowds with younger siblings on their hips to ensure that they were not overlooked. The organizational efforts required to organize these initiatives in villages throughout the continent of Africa was truly mind-boggling to Betty and me. One of the highlights of her life she recalls was placing those precious drops of vaccine on the tongues of dozens of children, knowing that she had helped to save their lives or protect them from a lifetime of crippling disease. I felt the same way, and I was just beginning my career in vaccines! Over the next ten days Bob introduced Betty to leaders from many villages, each who had organized elaborate parades, including musical tributes to polio eradication efforts, to coincide with the polio vaccine distribution. We ate roasted chicken and drank warm Fanta in the huts of local leaders and toured villages of all sizes. We were privileged to witness first-hand the successful implementation of a local Heifer Project (one of Betty’s favorite charities) in the small village Rusape, Zimbabwe. The villagers, who were the recipients of several milking cows through the program, had successfully raised the heifers that produced enough milk to supply the entire village. They were eventually able to purchase a pasteurizing machine and began to transport their milk via motorcycle to other local villages, thereby becoming financially independent. Bob also organized meetings with leaders from the World Health Organization, Rotary and UNICEF as well as the Ministers of Health from both nations, the First Lady of C’ote D’Ivoire, the Ambassadors, and even Princess Ann at the British Embassy. Over the course of Bob’s career at the CDC, he traveled to more than 25 countries and helped organize teams of thousands of volunteers who have vaccinated millions of the world’s most vulnerable children. As he reached the pinnacle of his career he became the recipient of several prestigious awards including the CDC’s distinguished William C. Watson Jr. Medal of Excellence and the CDC Foundation Heroes Award. In true Bob fashion, he donated his awards funds to help establish the Polio Eradication Heroes Fund which honors those injured or killed while working on vaccination campaigns with recognition and a cash award for their families. He also helped the CDC Foundation establish the Endowment for Global Health Priorities which offers flexible funding to address polio, vaccine-preventable diseases and other priority global health issues. In war-torn Somalia for instance, the funds were used to supply little things for health workers vaccinating children in country…little things being bullet-proof vests and ready-to-eat meals, satellite phones and essential training. As I searched online for information about Bob’s funeral, I came across an article in the Atlanta Journal-Constitution that struck me to the core. This past year, presumably in the midst of Bob’s endless medical treatments, he became involved in efforts to help a Kenyan woman who had been severely burned by her own husband. Men and women from across metro Atlanta began an effort to raise money and successfully petitioned the U.S. State Department to allow her to move to Atlanta. Bob, who had read about Faduma’s plight on a CDC list serve, turned his regular pizza night into a fundraiser that raised $770 to help with her living expenses. In the article, Bob stated “Just the thought of her being all alone affected me.” Here was a man who tirelessly traveled to 25 countries in efforts to eliminate the suffering of children worldwide and in his final months here on earth he thought not of his own ill health, but of the despair of a woman on the other side of the globe. He took action immediately to help make a difference in Faduma’s life; to show her that there are people who truly care about her. Bob has asked that his friends and family remember him not through tears and formal occasion, but instead through laughter. As Every Child By Two embarks once again in efforts to shore up support for international efforts to ensure access to life-saving vaccines for all children, we will continue to be inspired by Bob’s selfless achievements. In the meantime I’m pulling my bike out of the garage and damned the cold weather; I’m taking a hike this afternoon. 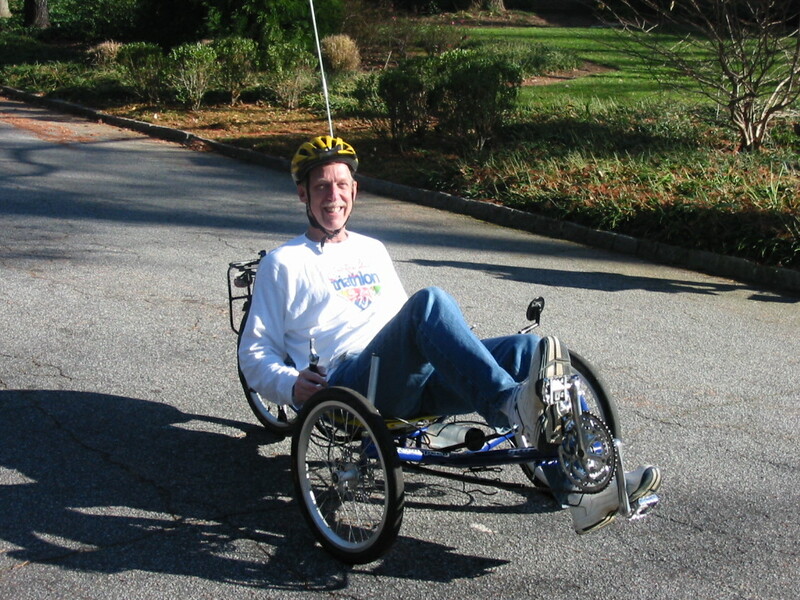 Bob Keegan on his recibant tricycle, as he traveled across the entire U.S. following his retirement from CDC. Bob has asked that donations be made to the following organizations in lieu of tears or flowers. Melinda Mailhot here. Bob hired me to work in polio eradication. I was actually the first PHA posted overseas. I was the only person to apply for the job in Brazzaville — twice. Maybe not what they were hoping for but they hired me anyway and for that I am eternally grateful. I’m going back to polio eradication at the end of January — leaving CT to go to DR Congo. This time we’re going to do it — for Bob. So happy to hear that Melinda – not great for CT but a great move for humanity. Do stay in touch! Hi Amy: Just reviewing Lauren’s blog about Bob and noticed the link for your post. Took me a while to find it, but well worth the search – nicely captures some of the spirit of our friend.